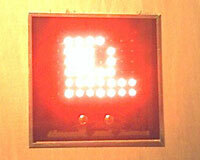 When people approach the project they see a screen of small light bulbs that displays live video. This project is a continuation of a larger study on the intersections of gender, space and movement. I am interested in the ways that space, light, movement and outline contribute to the construction of gender. A closed-circuit security camera faces a white wall. A java application receives the video data in two arrays. It goes pixel by pixel through each video frame. It averages the red, green and blue values to get the greyscale value for each pixel. The image is then reduced from 640 x 480 to 6 x 8 pixels. The resulting pixel information is then put through two for loops that look for the background color, which in this setting is white. This process is called background removal because in looking for the background it can find that which is not the background. The java application looks for white pixles and puts them into 6 arrays. These bytes are sent serially to the BasicX microprocessor. The BasicX sends the arrays to the first shift register. The shift registers are connected so that if the first one receives more than 4 bytes the extra bytes are shifted to the next shift register. The java application sends out 8 bytes, which fill both shift registers. Once they are both full the data is shifted out in parallel fashion so that the leds all receive their 1 or 0 at the same time. The resulting image is a silhouette. The LEDs are mounted in a grey plexi-glass box that is 1 foot x 1 foot x 6 inches. The plexi-glass box sits in a 5 foot 6 inch wood case. The case is made of 1/4 inch plywood.